A record crowd of over 10,000 people flocked to the event, opened by Lord of the Manor of Long Melford Sir Richard Hyde Parker and his wife Lady Jean, the occasion benefitting from some terrific weather and a whole host of activities. As well as live music – provided by rock band Route 66, the Sudbury Rock Choir and the Ipswich-based Samboomba Band – attractions included female Morris dancers, fairground rides, stationary engines and around 130 shopping stalls featuring a wide range of merchandise. Jess Poole, on behalf of the organisers, recently presented Kernos Clinical Director Chris Boatwright, with a cheque for £600, the donation from the proceeds of the Street Fair, saying: “We cannot thank you enough for what you do for the local community, and the kindness of your volunteers. Everyone at Kernos plays such a large part in providing stability, care and support for those who suffer in silence”. 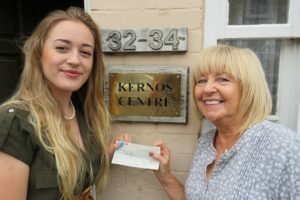 Kernos Financial Director Peter Brown said: “This very generous donation will greatly help towards ensuring our continued support for locally-residing adults and young people with mental health issues. “Although we are a small local charity, we nevertheless receive more than 250 referrals for help every year from within the local area. To meet that demand, local support is essential to supplement the grants we are obliged to source from further afield. “Unfortunately, these grants rarely cover the full cost of the service we provide and, even though over 50% of the hours worked at Kernos are voluntary, we still have fixed overheads to cover. 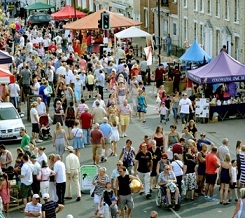 This is where local contributions are so essential to our continued existence and we’d like to thank Long Melford Street Fair very much for their wonderful gesture”.